← Queen’s Diamond Jubilee – 4th June. Is it just possible that you have ‘more’, for example, the actual original press cutting, e-mailable as an attachment any other article about her? Or, a local photo?I have a personal interest, in that my own grandfather was her captain from 1887 to 1898 – the ship is given as his “Usual Residence” when he married in 1889. The Liverpool & Cornwall Steamship Company’s passenger and freight S.S. ‘Hebridean’ makes her first sailing from Liverpool on Saturday next for Bideford. The ‘Hebridean’ will leave Liverpool each Saturday until the end of August, and every night on a Wednesday from Ilfracombe or Bideford. Under ordinary circumstances she will take about 24 hours to come down, and will be on Monday, Tuesday, and Wednesday in Bideford, possibly making day trips when convenient before her return. The ‘Hebridean’ is a handsome, up to date boat, and is registered for 312 passengers. The opportunity of making sea trips to and from Bideford under ideal conditions is one that will doubtless be appreciated, and should bring some new visitors into North Devon. The S.S. ‘Hebridean’, referred to in our last week’s issue, was the subject of much interest while lying at Bideford Quay yesterday. Visitors and residents will be afforded the opportunity of taking a cruise of the Bideford Bay in the ‘Hebridean’ on Tuesday evening July 25th, and a day trip to Lundy (allowing six or seven hours on the island) on Wednesday July 26th. The S.S. ‘Hebridean’ will make her last trip of the season to Lundy to-morrow, leaving Bideford Quay at 9 a.m.
( from articles in “Bideford Gazette”). 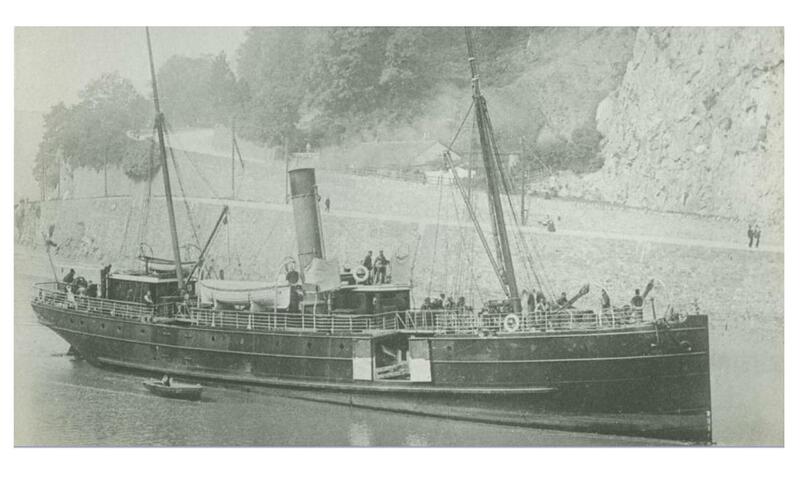 Ewen replies – For your efforts, and maybe for the ‘Buzz‘ files, a picture of the SS ‘Hebridean’ on the Avon near Bristol. I have also sent a copy to the North Devon Maritime Museum. See above. This entry was posted in History, Shipping and tagged bideford, bideford buzz, Lundy. Bookmark the permalink.